Once fall hits the Pumpkin Facial (with a pumpkin mask) is one of my most popular treatments. Not only does it smell delicious but you leave with an instant radiant glow. Not everyone has the time or budget to fit in a professional pumpkin mask treatment so I am going to show you how you can make your own right at home. 1/4 cup of organic pumpkin puree. I used a small pumpkin that I cut into slices, removed the seeds and microwaved it for 10 minutes. Apply the mask evenly all over your face, avoiding your eye area. Leave on for 15 minutes and then remove with a warm washcloth. 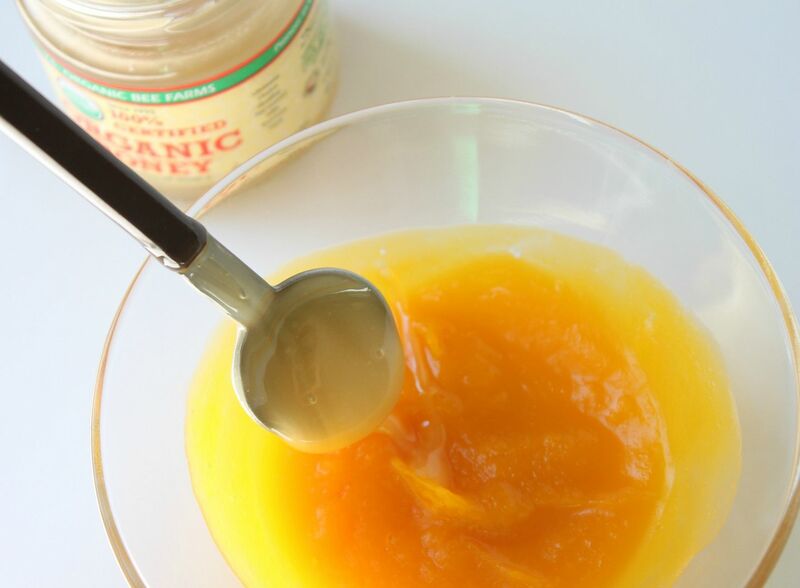 *If you have acne or are acne prone you can add a tiny bit of raw apple cider vinegar into the mask. 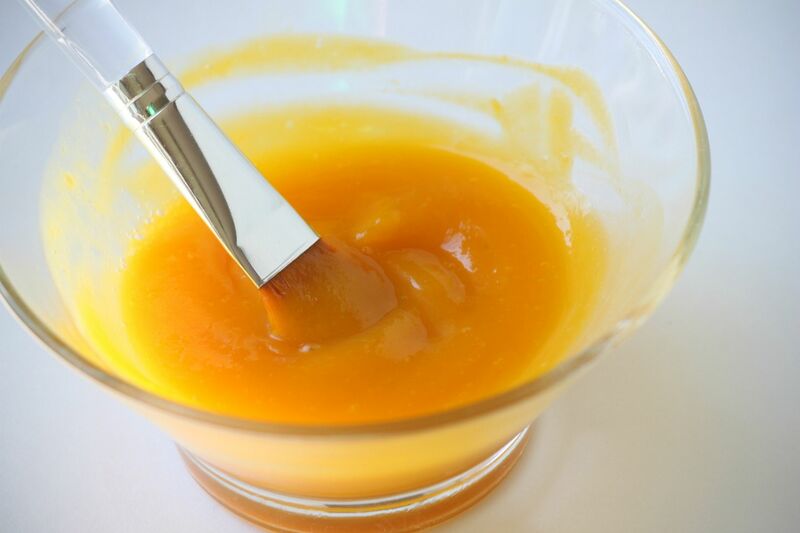 Your skin will feel softer and smoother as natural pumpkin enzymes treat and nourish your skin. It sounds nice! I can't wait to try it! I bet this smells amazing! I really need to try one of these masks soon! Sounds refreshing! I love pumpkin so I bet this would be fantastic! Definitely want to try! Thanks for posting! I had no idea pumpkin was good for your skin! I'm sure this smells amazing and no wonder it's such a popular treatment for fall! Ok, this is FABULOUS! Love love, and I'm trying it tonite! I can't wait to try this! Thanks for sharing :) I've been on a natural face product kick and this is absolutely perfect! I might want to eat the mix though, haha! I am SO trying this!!! I even have pumpkins from my own garden I can use and I just bought raw honey from the farmers market this weekend! So excited! I have almost ALL of these ingredients on hand. Yessss. Question: would almond milk work in place of the soy milk? Jamie- Yes almond milk is another great one to use! this sounds awesome. i am definitely going to have to try this one out. thanks for sharing!! Mmm, I bet your face smells SO good after this. :) I love this idea! Thanks Linds! Definately want to try this and yeah I already have the raw apple cider!! Wow..I bet this smells awesome!! I totally need to try this one out! This sounds great...can't wait to try.Thrilled to find and follow your blog!! This is SOOO AWESOME! What an amazing way to tie DIY, Skincare, and Fall all together! Genius! I am SOOOO trying this!!!! Mmmm...looks yummy enough to eat. I love pumpkin!! I can only imagine how awesome this is....Officially, on my..TO DO LIST!! oo, i want to try this!! I would love to try this! It looks fairly easy. Cute cute cute! This sounds amazing! And, I am sure smells heavenly. Ahh this looks amazing! Anything pumpkin is ideal in my book :) Gotta try! Oh, I wish I had saved the inside of the pumpkin I just carved for this! I've always wanted to try a facial mask. I think I'll actually give this a shot! Hey girl, thanks for the comment! I posted the Chicken Divan recipe so you can check it out! This mask looks so neat, I might have to try it! I'm whipping this up as soon as I type this! You have a wealth of information ~ pumpkin mask ~ awesome ~ so glad you stopped by ~ i'm now your newest "follower" ~ come follow me, too. I love a pumpkin mask especially when I don't have to pay the big bucks! Will be trying ASAP. Thanks!!! Lindsay, I am definitely making this. I am having some sugery next week and want to be at my best!Lots of extra supplements, veggies etc. Oh, I have a Designer Pillows Giveaway I hope you will join!! 1. I need to hightail it to my nearest pumpkin patch (I so need this mask!) You are awesome for sharing this! Thanks for this recipe! I have been trying a number of masks lately. I will be definitely trying this:) thanks! o wow...i am def gonna try this out this weekend!! wow :) thanks for sharing!!!!!!!!!!! so many uses for pumpkin! who knew. silly me, i've just been using them for jack-o-lanterns all this time. thanks! I'm doing this one! Glad you include ingredients to help acne prone skin! Thanks! I never do at home masks, but I bet this one smells amazing! I'm too lazy to make masks but this one looks delicious! I want to try this... love pumpkin anything, and if it can make my skin look better, bonus! I am a fan of anything pumpkin. This sounds amazing...I want to try it right now! Oh I just took a relaxing sigh just looking at this. I am so calling my esthetician for a facial tomorrow. If only she had this lovely concoction! At least I can do the DIY version - Thanks! I laughed when I saw this as I was like right she's officially done it! Combined two of my favourite things :) Pumpkin ... and face masks. I honestly can't wait to try it out. Lets see what Morgan says this time when the poor love has to sit there with me on the couch with pumpkin all over my face haha I will let you know how I go! Thank you so much for sharing this. I want to try this! I tried your baking soda cleanser trick and my skin feels amazing! This looks good enough to eat! Oh I can't wait to try this, thanks gorgeous! I'm carving pumpkins tomorrow so I'll definitely have the supplies for this! My daughter loves doing facial masks, and I just finished cooking down a pumpkin, so I guess this one will brighten her day when she gets home tonight! Thanks for the recipe! Love this but I have a few questions: does this need to be refrigerated and how long will it last? Yes this needs to be refrigerated and it will only last a few days at most.